Antifreeze Poisoning...What You Need To Know. 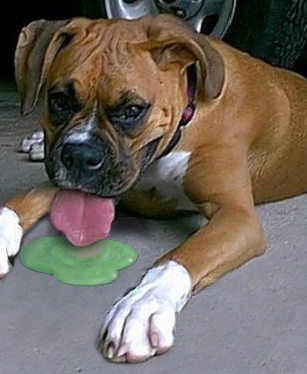 Antifreeze Poisoning…What You Need To Know. This time of year most of us in the Bloor West Village are forced out in the freezing weather to warm up and de-ice our cars before our trip to work. Many times this ritual includes topping up our windshield washer fluid and antifreeze. This task, if not done safely can have deadly consequences for our pets and wildlife. Antifreeze contains ethylene glycol. It is a sweet tasting, odourless liquid and is highly toxic to animals. Ethylene glycol can also be found, in lower concentrations, in some windshield de-icing agents, hydraulic brake fluid, motor oils, solvents, paints, film processing solutions, wood stains, inks, printer cartridges, etc. Unfortunately animals are attracted to the ethylene glycol by its sweet taste and will drink it voluntarily if they have access. Ethylene glycol is so toxic that only a tiny amount can have deadly consequences if ingested. As little as 1 tablespoon can be fatal to a medium sized dog! What are the signs of ethylene glycol poisoning? In “Stage 2” (which occurs 12 to 24 hours after ingestion), some of the signs seem to dramatically improve, luring pet owners into a false sense of security. However, during this stage, pets become dehydrated, and develop an elevated breathing and heart rate. signs of severe kidney dysfunction, which is characterized by swollen, painful kidneys and the production of minimal to no urine, may occur. It is critical that you bring your pet to a veterinary clinic if you know or even suspect that they have consumed ethylene glycol, or if they are exhibiting any of the early symptoms. Do not wait; time is of the essence and immediate treatment is essential! the antidote only has a narrow time period to work. Left untreated, the animal will die. Keep your pets and your local wildlife safe by storing your antifreeze where they can not access it, clean up any spills immediately and leave all pets in the house when topping up your reservoirs. Let’s keep ourselves warm and our pets safe and let the countdown to spring begin!